Last night, also decided to place the gas tank in the rear between the original firewall and the vert firewall. Build a compartment between the two thereby blocking the fuel compartment off from the cab compartment. Just making this stuff up as I go!! I like that. I've never liked where the fuel tank was mounted in a bug. Thanks Steve, I sent you an email. Just received my 10" extender from Dbug41 THANKS DOUG! That was fast and the quality on this thing is amazing! THANKS! Oh, I gave my 3 y/o son and 15 y/o daughter one of the smaller stickers and they were very happy. Kept the big one for myself of course! I've also decided to suicide the doors just to keep me busy. Never done suicide doors but have followed enough build thread on here to see it's possible. Been looking at all the various hinge and latch kits and it appears not all kits are treated equally. Seen prices range from $99 - 349. Is there a preference in kits that anyone might recommend? Thanks. Look at Bugroadsters kits. He has the slim line ones for bug doors. Nifty the man. looks good so far. Holy crap, this car is going to be gorgeous. Stood back and only to then realize...yup, this is NOT it. I felt like someone wronged me. Like I should fire the guy that came up with such a crappy plan. What a pile of poop! Two days later and now looking at the above photos, I feel like I still got shafted. The fenders mounting idea...all wrong. The shape of the rear quarters...all wrong. 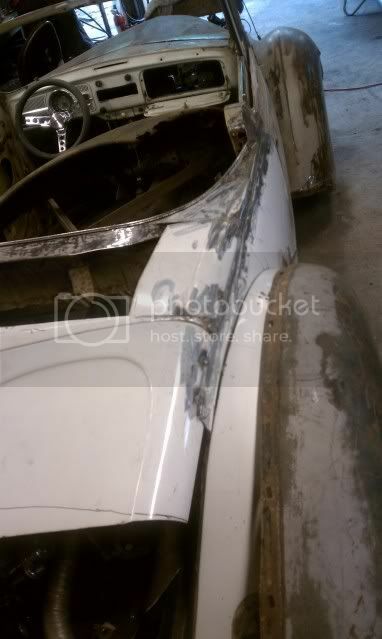 The front/rear decklid angle...yup all wrong. I'm going to need meds. If anyone sees anything "right' about the way the rear looks, please let me know. But I have a feeling the census will be, "go back to the drawing board and do it again!" Would T3 cooling help ? then move the motor forward. make the deck flow the way it should. 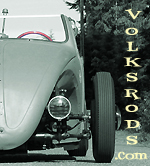 Does the rearfenders go further back than original beetle fenders? In that case type-3 cooling woulf be a good alternative? 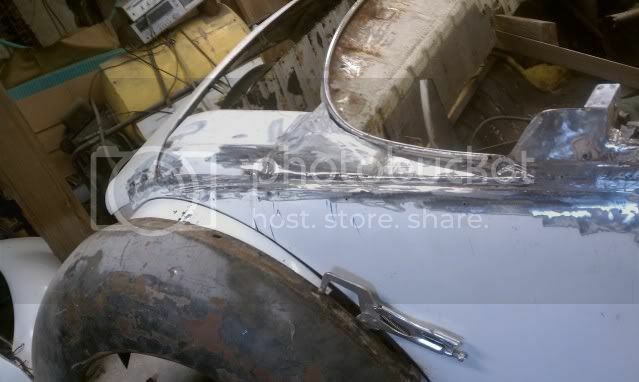 What about splitting the rear fender at the factory 37 Ford crown and then splitting the original VW fender at the same point and marry the two together. 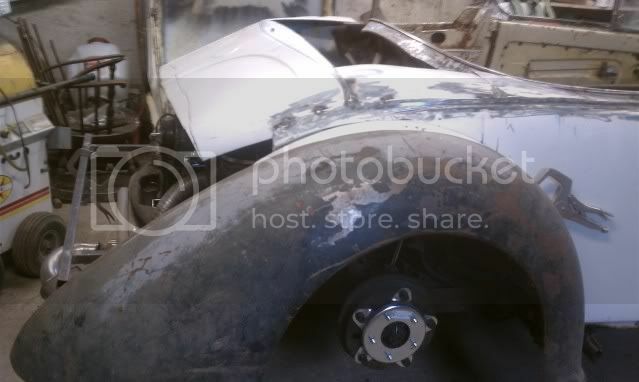 It will take a little hammer and bag and then english wheel or a plenishing hammer to get the right radius on the Vw side but then the fenders would bolt right back onto the VW body. 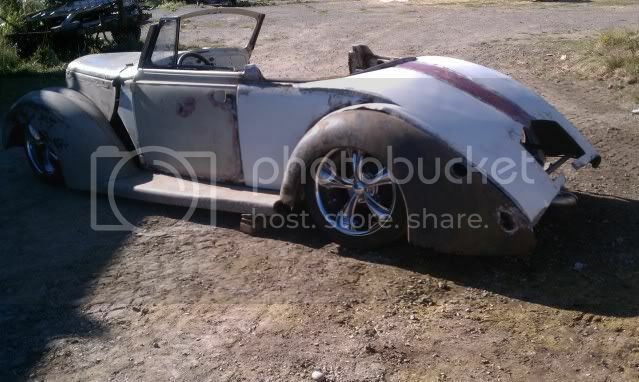 Another way might be to use the VW bug fenders but stretch them to the width you need and then add the last 1/3 of the trailing fender from the 37 Ford ,then weld a small rod up the middle of the whole fender to get your 37 Ford fender peak. pencil mark is to indicate cut and use trailing piece to the left of mark to make the transition for rear of fender. Just an idea to create a ton of sheetmetal work. What about narrowing the trunk lid off of a 1938-1940 Ford coupe to make that rear deck lid radius work with the fenders? Okay its 1:37 am and I just came in from the shop where we are building a 1932 Ford Pickup so I have too much Henry Ford on the mind and not enough sleep. Good Luck and I know it will turn out even better than the last two awesome VWs you have built. Last edited by 1jarhead2; January 3rd, 2012 at 06:30 PM. Ever thought about boat-tailing the back? this car is streight bad . i love it! Looking great so far Mark. 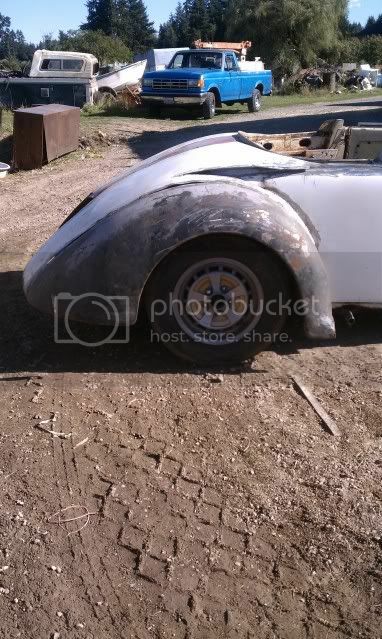 What about taking the rear curved section of a bug roof and grafing that in for a better transition of the hump? Flipping it around? Doesn't look like you are too far off, but I see what you are saying. You could still transition the body lines in the roof section in to the hood. I think you could pull off a merged stinger out the back directly under a sloped down boat tail type deck on that no problem. ya want that fender RIGHT where it is. ideally ya want to slop the decklid area down and flat as possible to juuuust clear the engine/alternator. look at original late 30's stuff ... thats what they did and it works wonderfully. ...and now that i look closer i see yer woah. Last edited by FONZY; September 11th, 2010 at 11:26 AM. Oh this is great. T-3 cooling I don't think will be necessary but it's an option if I find the rear decklid curve interferes. 1jarhead2 - made a trip out to a local classic car junk yard to find an early trunk lid but nothing really matched up to the lines of the fenders. I wish I could find a rear trunk lid and rear quarter panels off a 37 coupe! But I will tackle the rear tomorrow. See if it's possible to use some of the roof metal. Palepainter, I think you have something there with the roof metal. Fonzy, I'm following...the front hood section that is on there needs to be flattened out and spread between the fenders. I'm going to split the rear down the middle and spread it. I think I'm going to pull some sheetmetal off the roof, flatten out the widened cowl section and hood section and see if it's possible to blend the two together? On the rear apron section, I think I'll spilt the front clip as well as the rear bug clip and see if I can get one of them to work for the lower apron. Boat tailing the rear would add another degree of complication so I think trying the above might get me somewhere off stuck. Thanks for the advice guys. Let's see what happens Sunday. Ok...Took everything and went to town today. Updated my build thread, but wanted to let everyone see where their comments led me. Still have to cut in the rear decklid and the access panel for the fuel tank and shape the tops of the rear quarters, still to come. This also solved the fender mounting situation. Now looking at it, I think I need to chop the windshield down some more? I only took 2-1/2" the first go around. I'm thinking I should go another 1-1/2" Thoughts? OR...should I just lay it back a little? Give the windshield a little more rake? 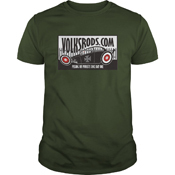 If you find some NOS VW parts, you could restore it to stock! "2 Bits ta' Look N' a lil More ta' touch"
Find More Posts by "Kid Casey"